This article describes how to use the Evaluate Model module in Azure Machine Learning Studio to measure the accuracy of a trained model. You provide a dataset containing scores generated from a model, and the Evaluate Model module computes a set of industry-standard evaluation metrics. We also recommend the video series by Dr. Stephen Elston, as part of the machine learning course from EdX. Connect the Scored datset output of the Score Model to the input of Evaluate Model. Click Evaluate Model module, and select Run selected to generate the evaluation scores. Connect the Scored dataset output of the Score Model to the input of Evaluate Model. Connect the output of the Split Data module that contains the testing data to the right-hand input of Evaluate Model. You can also connect a second set of scores to Evaluate Model. The scores might be a shared evaluation set that has known results, or a set of results from a different model for the same data. This feature is useful because you can easily compare results from two different models on the same data. Or, you might compare scores from two different runs over the same data with different parameters. Connect the output of the Score Model module for the second model to the right-hand input of Evaluate Model. Right-click Evaluate Model, and select Run selected to generate the evaluation scores. If you connect datasets to both inputs of Evaluate Model, the results will contain metrics for both set of data, or both models. The model or data attached to the left port is presented first in the report, followed by the metrics for the dataset or model attached on the right port. For example, the following image represents a comparison of results from two clustering models that were built on the same data, but with different parameters. Because this is a clustering model, the evaluation results are different than if you compared scores from two regression models, or compared two classification models. However, the overall presentation is the same. Accuracy measures the goodness of a classification model as the proportion of true results to total cases. Precision is the proportion of true results over all positive results. Recall is the fraction of all correct results returned by the model. F-score is computed as the weighted average of precision and recall between 0 and 1, where the ideal F-score value is 1. Average log loss is a single score used to express the penalty for wrong results. It is calculated as the difference between two probability distributions – the true one, and the one in the model. Training log loss is a single score that represents the advantage of the classifier over a random prediction. The log loss measures the uncertainty of your model by comparing the probabilities it outputs to the known values (ground truth) in the labels. You want to minimize log loss for the model as a whole. The metrics returned for regression models are generally designed to estimate the amount of error. A model is considered to fit the data well if the difference between observed and predicted values is small. However, looking at the pattern of the residuals (the difference between any one predicted point and its corresponding actual value) can tell you a lot about potential bias in the model. The following metrics are reported for evaluating regression models. When you compare models, they are ranked by the metric you select for evaluation. Mean absolute error (MAE) measures how close the predictions are to the actual outcomes; thus, a lower score is better. Root mean squared error (RMSE) creates a single value that summarizes the error in the model. By squaring the difference, the metric disregards the difference between over-prediction and under-prediction. Relative absolute error (RAE) is the relative absolute difference between expected and actual values; relative because the mean difference is divided by the arithmetic mean. Relative squared error (RSE) similarly normalizes the total squared error of the predicted values by dividing by the total squared error of the actual values. Mean Zero One Error (MZOE) indicates whether the prediction was correct or not. In other words: ZeroOneLoss(x,y) = 1 when x!=y; otherwise 0. Coefficient of determination, often referred to as R2, represents the predictive power of the model as a value between 0 and 1. Zero means the model is random (explains nothing); 1 means there is a perfect fit. However, caution should be used in interpreting R2 values, as low values can be entirely normal and high values can be suspect. Because clustering models differ significantly from classification and regression models in many respects, Evaluate Model also returns a different set of statistics for clustering models. The statistics returned for a clustering model describe how many data points were assigned to each cluster, the amount of separation between clusters, and how tightly the data points are bunched within each cluster. The statistics for the clustering model are averaged over the entire dataset, with additional rows containing the statistics per cluster. For example, the following results show a portion of the results from a sample experiment that clusters the data in the PIMA Indian Diabetes Binary Classification dataset, which is available in Azure Machine Learning Studio. The Sweep Clustering module creates multiple clustering models, listed in order of accuracy. For simplicity, we've shown only the best-ranked model here. Models are measured using all possible metrics, but the models are ranked by using the metric that you specified. If you changed the metric, a different model might be ranked higher. The Combined Evaluation score at the top of the each section of results lists the averaged scores for the clusters created in that particular model. This top-ranked model happened to create three clusters; other models might create two clusters, or four clusters. Therefore, this combined evaluation score helps you compare models with different number of clusters. The scores in the column, Average Distance to Cluster Center, represent the closeness of all points in a cluster to the centroid of that cluster. The scores in the column, Average Distance to Other Center, represent how close, on average, each point in the cluster is to the centroids of all other clusters. You can choose any one of four metrics to measure this distance, but all measurements must use the same metric. 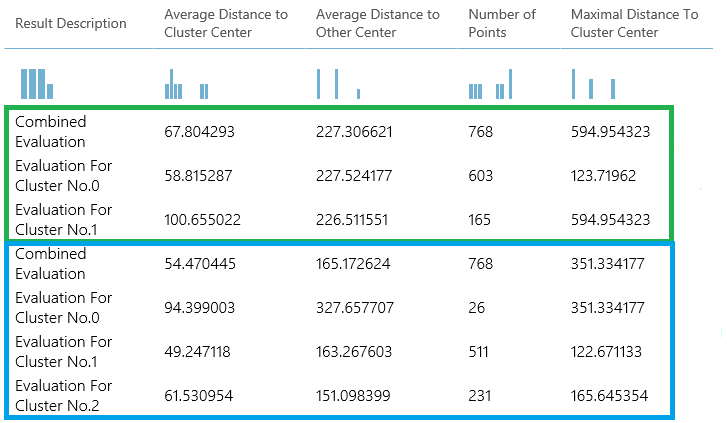 The Number of Points column shows how many data points were assigned to each cluster, along with the total overall number of data points in any cluster. If the number of data points assigned to clusters is less than the total number of data points available, it means that the data points could not be assigned to a cluster. The scores in the column, Maximal Distance to Cluster Center, represent the sum of the distances between each point and the centroid of that point’s cluster. If this number is high, it can mean that the cluster is widely dispersed. You should review this statistic together with the Average Distance to Cluster Center to determine the cluster’s spread. For examples of how to generate, visualize, and interpret evaluation metrics, see these sample experiments in the Azure AI Gallery. These experiments demonstrate how to build multiple models and use Evaluate Model to determine which model is the best. Compare Binary Classifiers: Explains how to compare the performance of different classifiers that were built using the same data. Compare Multi-class Classifiers: Demonstrates how to compare the accuracy of different classification models that were built on the letter recognition dataset. Compare Regressors: Walks you through the process of evaluating different regression models. Demand estimation: Learn how to combine evaluation metrics from multiple models. Customer relationship prediction: Demonstrates how to evaluate multiple related models. Error 0025 Exception occurs if dataset does not contain a score column.